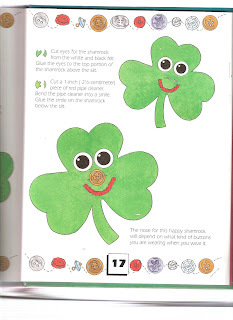 Here is another child’s craft for St. Patrick’s Day that you could quickly make the night before. Cut a small shamrock from green felt. Cut a ½ inch slit across the center of the shamrock for a button hole. Cut eyes for the shamrock from the white and black felt. Glue the eyes to the top portion of the shamrock above the slit. Cut a 1 inch piece of red pipe cleaner. Bend the pipe cleaner into a smile. Glue the smile on the shamrock below slit. The nose for this shamrock will depend on what kind of buttons you are wearing on your shirt. Share your ideas on this or anything here on the blog either here or e-mail me at sandi_tipple@yahoo.com. I look forward to hearing from you!